Universal Products manufactures a wide range of graphics that are screen printed or digitally printed to produce original designs with eye-popping colors. All of Universal Products' graphics have a UV clear-coat applied to the graphic to ensure durability against the sun and chemical contamination. Universal has graphics ranging from small kits, designed to work with a pinstripe, all the way to large graphics that give the vehicle a custom paint look. Whatever size you are looking for, Universal has the right size graphic for the job. Most of Universal’s graphics are available in multiple color combinations like grays, blues, red’s, golds. There is a combo that is perfect for matching any vehicle color scheme. There are a few in purples and greens - for those more wild applications. Several of the older kits that have been discontinued are now available in the Classic Silver combinations. Pinstripes, Solids and so much more! Universal Products has one of the largest and most complete lines of pinstriping, solids, and roll goods in the industry. Utilizing state-of-the-art rotary-die-cut machines in order to produce pinstripe and roll stock products to exact specifications. All Universal striping is packaged in a unique "dispenser" box that allows you to work with the stripe without taking it out of the package. Universal Products has a huge selection of sizes in their striping from 3/16” pinstripes to 48” roll goods. They have the right size stripe for most projects. Pinstripes and roll stock are available in over 100 single color and over 70 two-color combinations. Need multi-line stripes? Universal has Mirage striping and Linear striping available in solid or multi-color stripes. 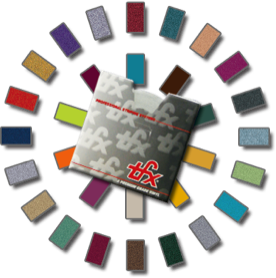 All pinstripe and roll stock has Universal’s exclusive TFX Plus adhesive. This adhesive was developed for Universal by Avery Dennison and is the perfect solution for most applications. This adhesive was designed to offer the legendary repositional characteristics of TFX, with much better cold weather adhesion. Universal Products offers a 3-year warranty on all of their products. All 2mil striping and graphics are warranted on side applications only and are not recommended for the hood, roof, deck-lid or spoiler.